● Aric Almirola started 20th and finished Stage 1 in 34th. ● Almirola remained in the top-20 for the majority of Stage 1 until he made a scheduled green-flag pit stop on lap 21 for fuel, four tires and adjustments. ● Due to the late-stage scheduled stop, Almirola didn’t pit during the Stage 1 break. ● Almirola started Stage 2 in 18th and concluded it in 36th. ● After cycling through to the ninth position, Almirola had to visit pit road after he made contact with the wall on lap 46. While visiting pit road, Almirola received a pass-through penalty for an uncontrolled tire. 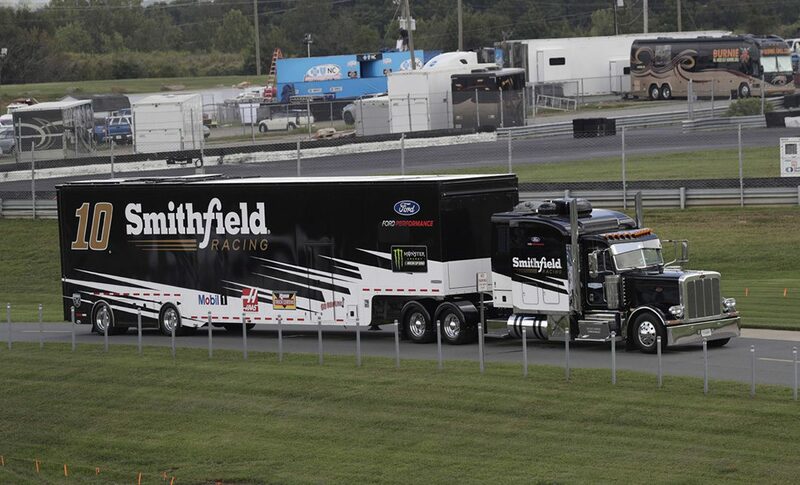 ● Even though the Smithfield driver served the penalty under green, he was able to remain on the lead lap. ● During the Stage 2 break, Almirola came down pit road to allow the pit crew to take their time and repair any damage from the previous incident. ● Almirola started the final stage from the 36th spot and ended it 19th. ● Almirola stayed out during the lap-65 caution and restarted 17th. ● After contact from another competitor on lap 69, Almirola went sliding through the grass. Fortunately, the No. 10 machine did not receive any additional body damage, and the Tampa native brought his Ford Fusion down pit road for service. ● Almirola restarted toward the rear of the field and worked his way forward. ● By lap 83 he was back up to the 17th position, and on lap 91 he reached 15th. ● The race remained green until lap 102. During the caution Almirola came down pit road from 18th for fuel and four tires. ● Just after the restart on lap 103, the 34-year-old came to a stop on the track after an accident occurred in front of him. Unfortunately, another competitor rear-ended the No. 10 machine causing more damage. ● The damage was severe enough that Almirola had to come down pit road for repairs. He once again had to restart deep in the field. ● After a nail-biting final three laps, Almirola finished in a three-way tie for a spot in the Round of 12 playoffs. ● Almirola’s previous Round of 16 playoff finishes at Las Vegas Motor Speedway and Richmond (Va.) Raceway broke the tie, allowing the Tampa native to advance to the Round of 12. ● While this is Almirola’s second playoffs appearance, this is the first time he has advanced to the Round of 12. ● This was Almirola’s 22nd top-20 of 2018. The next event on the Monster Energy NASCAR Cup Series schedule is the Gander Outdoors 400 on Sunday, Oct. 7 at Dover (Del.) International Speedway. It is the fourth race of the 10-race playoffs and the first race in the Round of 12. It starts at 2 p.m. EDT with live coverage provided by NBCSN beginning at 1:30 p.m.